Anna Bonitatibus . :: Semiramide – La Signora Regale ::. Latest News, Reviews. Comments on Semiramide La Signora regale by Schoolars and Musicologists. Una cantante e un progetto discografico tutto italiano dedicato alla figura di Semiramide. Quando ricerca e interpretazione s’incontrano. October 24,th 2014, at Moscow’s Svetlanov Hall marks not only the concert premiere of Semiramide – La Signora Regale, but also marks the world premiere of Rossini’s original version of Bel raggio lusinghier. Anna Bonitatibus is the first interpreter of this version of the Cavatina, most likely only heard by Rossini himself and Isabella Colbran over 190 years ago. That same evening will also be performed the aria Son infelice, son sventurata from La Morte di Semiramide by Sebastiano Nasolini, yet another world premiere. A l’occasion de la sortie de son dernier enregistrement solo, consacré à la légendaire Reine d’Assyrie Sémiramide « de Porpora à Rossini », la mezzo-soprano italienne Anna Bonitatibus nous fait le plaisir de répondre à nos questions, dans un français impeccable. Difficult, perhaps, but magnificent! Italian mezzo-soprano Anna Bonitatibus’s recently released two-CD set, titled Semiramide, La Signora Regale, is a thrilling collection of Baroque and bel canto arias and scenes inspired by the legendary Assyrian queen, assembled with meticulous research, presented with the lavish accompaniment of art and poetry, not to mention the brilliant musical partnership with Federico Ferri and the Accademia degli Astrusi and La Stagione Armonica. For Bonitatibus it has been a labor of love. Come si può facilmente immaginare, quelle stesse sezioni che suscitarono in me grande sorpresa, hanno ora risvegliato molta attenzione nel mondo accademico e non posso che esserne contenta pur invitando a non trascurare il valore del ri-nato operista Sebastiano Nasolini. La scena presentata nell'album è la versione che Isabella Colbran fece ascoltare ai napoletani e con la quale ho inteso renderLe un mio personale omaggio. Semiramide is such a fascinating, multi-faceted character – when did you first fall under her spell, and how did you set about researching her story and her music? It was one of my wishes to work on a new project that could recount just how important Music, Opera, and Art in general is to our lives today more than ever despite those who think that opera is near to an end and recordings are just a question of marketing and business. Semiramide appeared extremely fascinating and perfect for this reason. Since my first researches, I found she was misunderstood as a queen and especially as a woman, which to me, is not a matter of a century or a millennium, is a point of strength and also a point of reference. We introduce her true story first and then we continue with the layers of myth surrounding her. Join us for this fascinating and original musical program as we peer into the world of Semiramide, ‘Superwoman‘, builder and warrior, the 'Venus' of Mesopotamia, wife and queen, widow and mother. Winner of The International Opera Awards for the Best Operatic CD Recital 2015. Within this unique dream that is now becoming true, I see one very important sign: the encouragement from each of you by believing in the strength of Culture and in the power of Music; the only arms I take-up to defend knowledge and peace. Thank-you from the bottom of my heart for giving me the possibility to express these sentiments, for giving me the possibility of flying on pure happiness after the four years of deep and difficult work done on behalf of this project. My gratitude goes to each member of the crew and to Sony and Deutsche Harmony Mundi, that allowed the birth of Semiramide – la Signora regale. Synthèse de presse sur Semiramide La Signora regale. A wonderful concert from one of the great mezzo-sopranos of our day. Obwohl die sagenumwobene assyrische Königin Semiramis die Komponisten des 18. und 19. Jahrhunderts zu mehr als 100 Vertonungen inspiriert hat, hat sie im heutigen Opernrepertoire nicht mehr den Bekanntheitsgrad einer Cleopatra, Armida oder Alcina. Selbst die wohl bekannteste Fassung von Gioachino Rossini ist recht selten auf der Bühne zu erleben. Die italienische Mezzosopranistin Anna Bonitatibus hat sich vorgenommen, daran etwas zu ändern, und deshalb nicht nur eine Doppel-CD unter dem Titel Semiramide - La Signora regale mit Arien aus zahlreichen Vertonungen eingespielt, sondern tritt nun auch in der Philharmonie Essen in der beliebten Reihe Alte Musik bei Kerzenschein auf, um der Königin mit Arien von unterschiedlichen Komponisten ein Denkmal zu setzen. Dabei präsentiert sie nicht nur Arien von der CD, sondern auch weitere Vertonungen, beispielsweise von Christoph Willibald Gluck und Ferdinando Bertoni. Andere auf CD eingespielte Nummern lässt sie weg, um einen weiteren Anreiz zu schaffen, im Anschluss an das Konzert die CD zu erwerben. Und Bonitatibus präsentiert sich an diesem Abend nicht nur stimmlich als Königin. […] Doch als er zum tödlichen Schlag gegen Assur ausholt, trifft er seine Mutter, die zu seinem Schutz herbeigeeilt ist, und rächt damit den Tod seines Vaters. Bonitatibus präsentiert aus Sebastiano Nasolinis Oper La morte di Semiramide die Szene, in der Semiramide der Geist ihres verstorbenen Gatten erscheint. 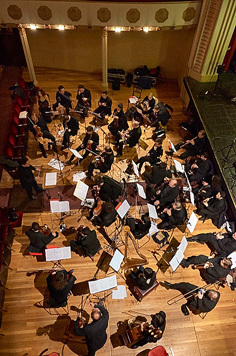 Diese Szene wurde 1815 in Neapel mit Versatzstücken aus Marcos Portugals Vertonung und Koloraturen von Gioachino Rossini ergänzt, weil hier niemand Geringeres als Isabella Colbran die Titelpartie übernahm. Bonitatibus erweist sich erneut als Meisterin stupender Koloraturen und begeistert das Publikum durch schnelle und flexible Läufe. Natürlich darf auch die berühmte Kavatine "Bel raggio lusinghier" aus Rossinis Oper nicht fehlen. Die italienische Mezzosopranistin Anna Bonitatibus hat diesen Schatz aus den Notenarchiven gehoben, hat aus den vergessenen Dramen um die antike Heldin einen unterhaltsamen Abend zusammengestellt. […] Hier wütet Semiramis, weist ihren treulosen Liebhaber mit entschlossenen Gesten zurück. Großartig sind die abrupten Stimmungswechsel: Erst ist alles furios nach außen gerichtet, dann zieht sich Anna Bonitatibus sofort in die intime Klage, oder auch: in ihr Selbstmitleid zurück; sie seufzt, leidet. […] Großer Jubel für eine großartige Künstlerin. (…) Anna Bonitatibus performed with great intensity at Wigmore Hall. And in the recital which the Italian mezzo Anna Bonitatibus has compiled – from which she’s also made a prize-winning disc – variations on the tale came from eleven 18th-century composers. (…) Ms Bonitatibus was in terrific form, which was just as well given the demanding programme. all [the pieces] required the full mezzo range and occasional moments of deep chest voice but mostly fiery, fast coloratura – the sort of repertoire Cecilia Bartoli might sing – launched with gusto, feeling and commitment. She was also perfectly at ease in the temporal trip through the Baroque, Classical and into the bel canto arena, adapting her sense of expression and lyricism to each. (…) Bonitatibus brought a vivid sense of theatricality and engagement to each aria, combining a vivid technique with a striking physicality; she certainly is not a singer to just stand and deliver. Though she did use music, she was strikingly engaged with the audience and we had a degree of visual stimulus too. Not just Bonitatibus's highly mobile platform manner, but her four different outfits ensured a striking visual side to the programme. 17 Tracks of music about the legendary queen Semiramis comprising over 100 minutes of music including the bonus tracks. 14 World Premiere Recordings including the never before heard original version of Gioachino Rossini’s Bel raggio lusinghier. 132 Page lavishly illustrated booklet in 4 languages. Critical editions based on original sources by Davide Verga and Alessandro Monga (Ed. 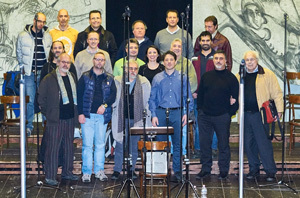 Consonarte, London); Marco Beghelli and Stefano Piana (Ed. Beghelli, Bologna) for track 5/cd2; Philip Gossett (Edizione critica della Fondazione Rossini di Pesaro, in collaborazione con Casa Ricordi, Milano, a cura di P. Gossett e A. Zedda) for track 6/cd2. The CD’s booklet is written in English, German, French as well as Italian. Aria lyrics are in their original language with an added short scene synopsis and English translation. 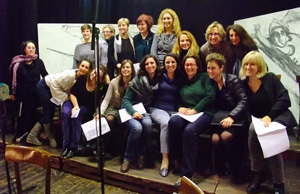 Women’s Choir from La Stagione armonica for the recording of Bel raggio lusinghier from Rossini’s ‘Semiramide’ . Il piacer, la gioia scenda from Meyerbeer’s ‘Semiramide’. Semiramide – La Signora regale.